The drone bay is a 3D hub screen and tool for preserving your ships between missions. But this hallowed hall isn't just a place to patch hull dents and scrape off molten slag. It’s where you’ll tailor Descent: Underground to your gaming preferences. You'll configure your ships' armaments; you’ll swap in new wings, noses, and tail pieces; paint on decals and art; make custom looks on the fly - and it will all take place in your personal drone bay. Now is your chance to be a part of this exciting Kickstarter campaign. Join us as we re-imagine a PC gaming classic - Descent: Underground. SHOUT OUT TO SOME EXCELLENT DEVELOPERS!!! If you are like us here, at Descendent Studios, I am sure you are a huge fan of the Gold Box Dungeons and Dragons games. TSI, the spiritual successor to SSI, has just launched a brand new Kickstarter. In Seven Dragon Saga you will shape the wild and dangerous Drakelands with your choices. Impress with noble deeds. Coerce with threats and violence. Or simply lay waste to the empire's enemies without mercy or regret. The game will feature tactical, turn-based combat and a dramatic storyline with plenty of side content to explore. If that kind of game thrills you as well, then hop over to their Kickstarter and show those guys some love and let's get a great new game funded. Thanks to all of you for your continued support. Dang it! It looks like Peas got in your hangar! AngryPeas in the hanger? Hanger is tainted, must be purified!! Pretty 3D modeling, but I'm a bit confused here. To quote WingMan: "Any material will be picked up by the drones and brought back to the harvester where all the players reside in their personalized pods with cockpit." << http://descendentstu...ok-like/?p=2152 I thought all of these drones were fast-fabbed from templates on an as-needed basis, while the operators sat in cockpits that were largely removed from drone fabrication? Is this "hangar" really the assembly line for those fast-fabbed drones, or something else? It looks pressurized, which means humans could probably walk about in it without EVA suits. 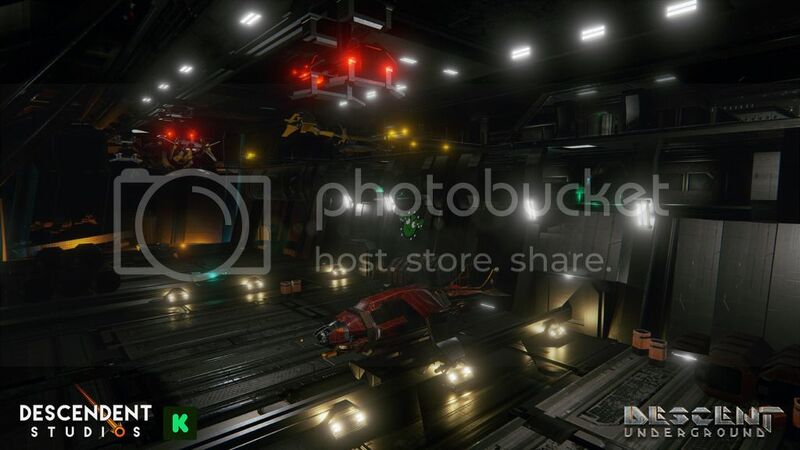 This blog states that "The drone bay is a 3D hub screen and tool for preserving your ships between missions. But this hallowed hall isn't just a place to patch hull dents and scrape off molten slag. It’s where you’ll tailor Descent: Underground to your gaming preferences." Why would expendable drones be "preserved" when they can be fast-fabricated quickly and cheaply enough to allow for combat reinforcement? Why would hull dents need a "patch" when an entirely new drone could be cranked out? Will there be gameplay mechanics for "carrying a single drone from match to match", or an arbitrary "limit" on respawns due to there not being enough drones in the pilot's bay? As for the idea of a drone bay, I'm sure we all remember those dreaded purple robot-spawners from Descent! Maybe this is the ancestor of that technology, just like the Torch KS is the ancestor of the beloved Pyro GX? There's something exciting to think about! Finally, just to mention it, while pretty graphics are cool I'm quite all-right with a purely text-based point-and-click menu until the gameplay is nailed down tight. I'll hopefully be spending far less time in the menu than in the game! I like it! A bit under-lit imo, but early days. I love it. Yes if your drone gets destroyed another gets fabled out but if not it returns after the mission and may well need dents fixed and what not. It's more for fun than anything i'm sure and it gives a place to personalize and such. I like it. Can't wait to walk around and see my drone and mod them out and such. Looks very nice, even with the Peas' graffiti. great work i want it bigger !!!!!!!!!!! @___@ I have been splattered across the walls. In the grim near-apocalypse future, careful resource rationing is key. Drones can be quickly reprinted and relaunched again after destruction, but metal is still not to be wasted. The corps aren't above recycling to save the bottom line a little. But more importantly, the drone bay is the heart of Descent: Underground's customization options. Make a stylish fighter, fly it to victory, and win mother lodes for your chosen corp. But more importantly, do it in style. Give your foes something stylish to remember! The Kickstarter is still raging everyone! If you haven't seen the latest update about the Torch KS, take a look! Your support helps us build Descent: Underground piece by piece. Liking the overall tone, but(there is always one right). the lights are off. i honestly can't see a thing, well i can, but the lights are way too bright and eyes go to them, it could also be tightly packed, now there seems to be a lot of empty space which i would assume in a spaceship is a big nono, even in scifi setting. having said that, stunning work still. keep it up in the trenches. David Shelley... that is a name I have not read in a long, long time. Loved the SSI AD&D games back on the C64. I remember playing Champions of Krynn back when I was 10 or so in English before I even had my first English lesson in school. My teacher was surprised I did not know basic English words like 'pencil' but stuff like 'two-handed sword', 'chain mail' or 'ring of protection + 1'. Also played Pool of Radiance and Curse of Azure Bonds but I preferred the Dragonlance universe over Forgotten Realms. The round based combat system of these games was brilliant back then offering more flexibility and control than any other RPG, hell even today there are bad RPG that do it much much worse. Is there any new or updated materials for the 'Drone Bay'? Would love to see some pictures. First Update on a Fantastic Kickstart!